Venezuela’s record is full of warts, but Washington is hardly blemish-free. Over the past several weeks, the State Department repeatedly has expressed its selective indignation towards the violence now being witnessed almost daily in Venezuela. On February 15, Secretary of State John Kerry detailed U.S. concerns over detentions of protestors in Venezuela, and specifically cited the arrest warrant that had been issued for opposition leader Leopoldo Lopez. The U.S. writ calls upon Venezuela to release the detainees from the hands of the government and provide opportunities for dialogue with the opposition. On Tuesday, February 18 Lopez turned himself in to the authorities amid rumors that fellow members of the opposition were plotting to kill him in order to give the right an opportunity of appearing to be victimized by the government. On February 21 Secretary Kerry expressed his alarm regarding the detention of Lopez and Venezuela’s “use of force and judicial intimidation.” Kerry most provocatively claimed that, “this is not how democracies behave.” But the State Department has not always been a champion of democracy either, as it has sometimes directed charges against Venezuela based on conjecture and with little or no evidence. While the statements by U.S. officials have overwhelmingly focused on allegations of Venezuela’s mismanagement of the very volatile situation existing in the Latin American country, it hardly recognized -at least not in any detail- the disruptive tactics of some elements of the opposition. This is in keeping with Washington’s unremitting vendetta against Chavismo, which now has been seen for over a decade. On February 19, President Barack Obama recapitulated Kerry’s focus on Venezuela during the segment of the North American Leaders’ Summit in Toluca, Mexico, while Canadian Prime Minister Stephen Harper, and Mexican President Enrique Peña Nieto were in attendance. Obama encouraged the release of protestors and peaceful discord, while foregoing any hostile rhetoric touching upon the violence and death perpetrated by the more extreme elements of the opposition, such as attacks on government buildings and other properties, as well as public spaces, including metro stations; the torching of state vehicles, including municipal buses; the construction of barricades to block traffic; the use of wire to “neutralize” cyclists (leading to injuries and decapitation), and the use of firearms, incendiary bombs, rocks and other instruments to register their protest. 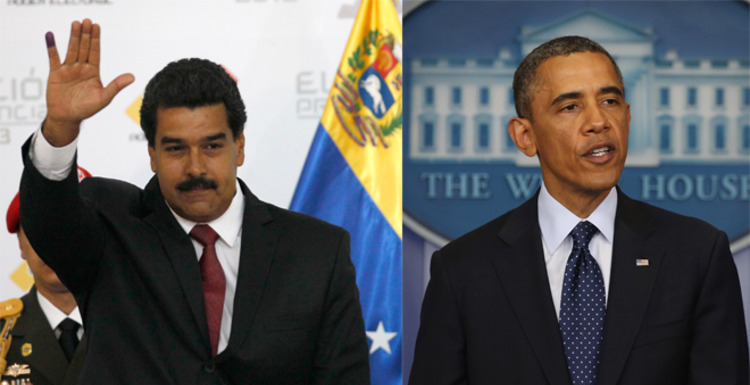 This past Saturday, President Maduro said he was open to dialogue with the United States. Today, February 25, Maduro made calls for a “National Peace Conference” to take place among all sectors of the country, including the opposition, as a means to promote peace in Venezuela. On the same day the U.S. reciprocated action taken by Venezuela a week ago by expelling three Venezuelan consular officials, while Maduro proposed a new ambassador to the U.S., the well-regarded Maximilian Arveláez, be reviewed by U.S. authorities. Maduro’s move is a bold attempt to escape from the downward plummet that now characterizes U.S.-Venezuelan diplomacy. Maduro’s call for discourse with both the opposition and Washington ought to be taken seriously, especially by the U.S., taking into consideration its troubled policy toward Latin America. Presumably, Washington would joyously embrace such discussions in almost any other place in the world dealing with similar internal-conflict. Now is the optimum time to accept calls for a peaceful conversation between the U.S. and Venezuela, and to respect each nation’s sensibilities and legitimate foreign policy goals, not to continue U.S. indignation towards a rocky Venezuelan government that needs peaceful times in order to stabilize.